error message I enter reads "This Job Code is exempt from this process"
[exceptions] after i save the formula converts to this..
this didnt work correctly so i reversed the outcomes IF([Job Code]=[exceptions],"False","True") which is the result i want, if the number exists in the exceptions collumn i dont want them to be able to save! 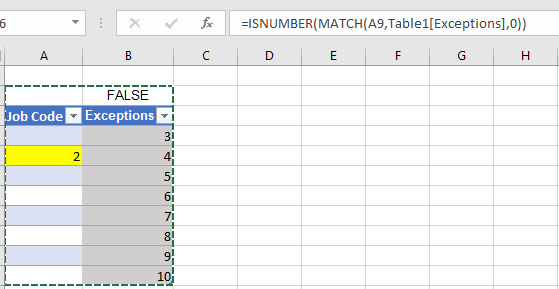 =IF(SUMPRODUCT(--(A2:F2=A3)),TRUE,FALSE) this works but i dont know how to convert the single cell and range/array into sharepoint Any help is greatly appreciated! 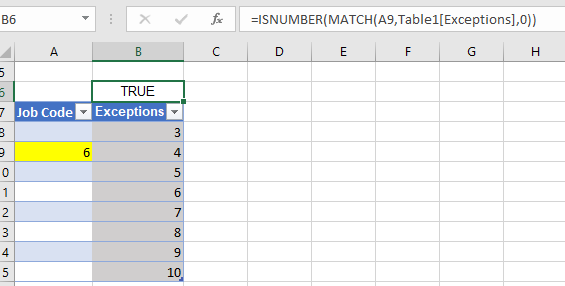 Unfortunately, the Validation Setting formula is only applied to specific fields on the same ROW. Therefore, you can't search for column values and validate against these values in the SharePoint validation setting or calculated field like Excel formula! We need using some code to achieve it. The following code for your reference, add the code into script editor web part into new/edit form page. Not the answer you're looking for? Browse other questions tagged sharepoint-online validation-list-items or ask your own question.